LA's Dog Cafe serves coffee and puppy kisses. This dog cafe promotes play time, socialization, and adoption of canines, and also hosts dog yoga classes. We're happy to add yet another dog friendly activity to the list! We've mapped out beer yoga and yoga classes at breweries extensively on our yoga page. Also on that page are yoga experiences that involve mimosas, brunch, coffee, kombucha, tea, and even spirits like tequila! Acro yoga blends the acrobratic arts with the practice of yoga. Our favorite brewery for acro yoga to date is Dialogue Brewing in Albuquerque. Why? Dialogue not only has a gorgeous outdoor patio with a unique structure, artists from ABQ Circus Arts perform there from time to time. ABQ Circus Arts both performs and teaches classes in the Albuquerque area. Acro yoga can have aerial elements, it can involve catching or throwing a partner, and is entertaining to watch or try yourself. Acro yoga is a fun type of yoga because many moves promote (or require) others, so it's a truly social form of yoga. Goat yoga, believe it or not, has become popular in several states in the U.S. During goat yoga, expect a goat to walk on your back. We're not kidding...you are! Heavy metal yoga is an alternative form of yoga developed by yoga Instructor Saskia Thode. 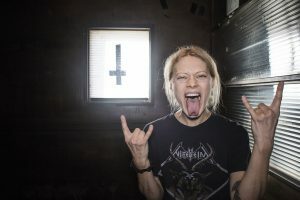 Saskia grew up in Northern Germany in close proximity to the Wacken Open Air festival, and started listening to metal as a young teenager. After starting her yoga practice in Germany, she moved to New York City in 2006 and has been an integral part of the metal yoga scene since. Metal yoga involves unleashing your inner beast, which may involve screaming to a simultaneous blast of metal music. Saskia's classes are also set to extreme heat to purge you via sweating. "Raise your metal horns (mantras), and offer your practice to the darkness. We will be holding poses until we are feeling their hellish fire creeping into our bodies until we rest like the dead in Corpse Pose in the end of the class." is still exactly what it sounds like. We replace the calm Himalayan chants with Big Moe, 2Chainz and twerk-inducing music. For Volume 2, we are honoring our Houston roots by taking the music you love and playing it "Chopped & Screwed," which is a technique created by hometown legend DJ Screw, (duh). The flow will be led by yoga instructor Alicia Tillman, A.K.A Awkward Yoga Girl, who takes you through a fun, challenging, all-levels flow that also requires an explicit language warning. It gets real. Afterwards, we skip the protein shakes and instead, give you the best damn tacos Houston has to offer. "I didn't know what yoga was but I heard there were nuggets so I turned up."